If you have pets, chances are that some amount of food and water end up on the floor during feeding time. 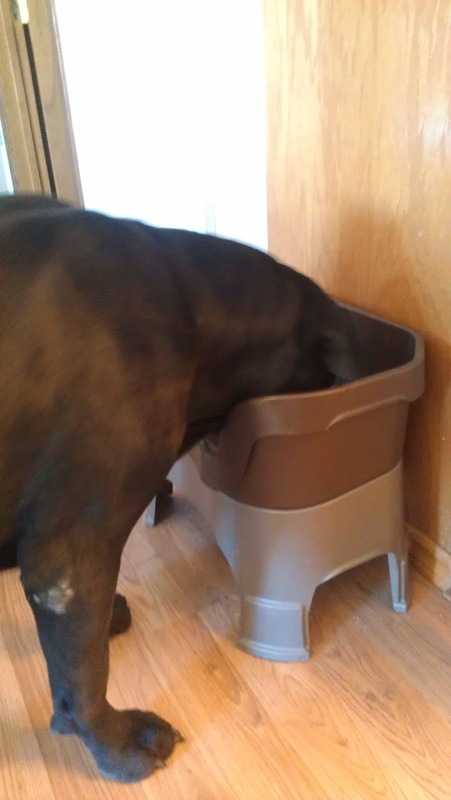 We have two large dogs, mastiffs, and they can be very messy when they eat and drink. Whether they are slobbering, the food gets stuck in their jowls, or they get a little clumsy and tip the bowl over... my dogs do it all! I was recently given the opportunity to try out the Neater Feeder elevated pet bowls with my dogs. 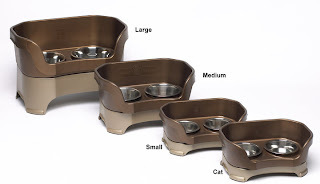 The Neater Feeder comes in a variety of different sizes for small dogs, large dogs and even cats. Leg extensions are also available for tall dogs to elevate the bowl to just the right height. When our Neater Feeder arrived, I immediately noticed how strong and sturdy it was. This pet bowl is durable and will last for years and years. Inside or outside, I have no doubt that it will stand the test of time. I also love how easy it was to prepare for use and how simple it makes feeding and clean-up! No matter how big or little your pet is, there is a Neater Feeder perfect for them. Since our dogs are big, the large Neater Feeder with leg extensions was the perfect fit. 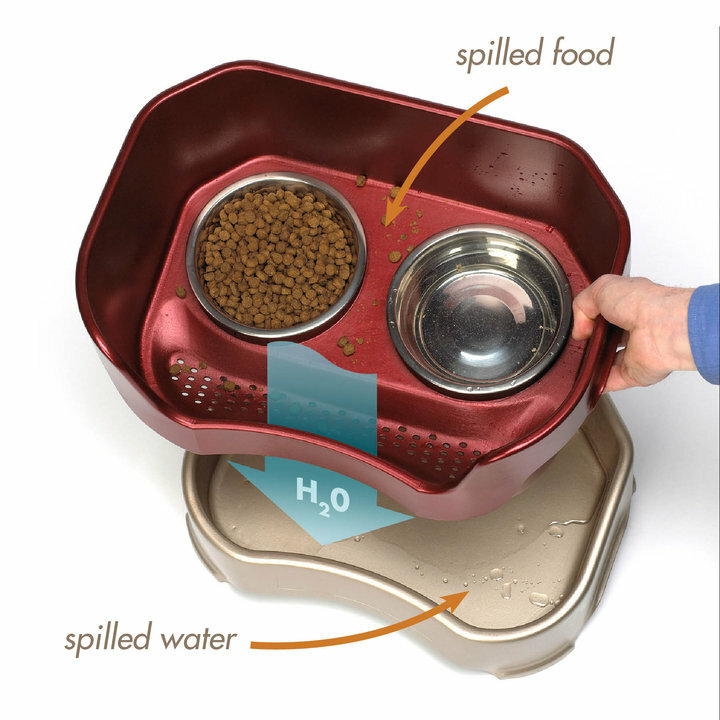 The Neater Feeder is designed with protective walls to contain splashes and spills. The spilled water drains into a lower reservoir that can safely contain more than an entire bowl of spilled water, keeping it off the floor until you are ready to dispose of it. Keeping the spilled food in the upper reservoir, off the floor, not only saves you work, but also keeps it clean for reuse. This giveaway will end October 24th at Midnight EST. Disclaimer: I received a complimentary pet bowl from Neater Feeder for the purpose of writing a review and hosting a giveaway. Regardless, I only recommend products or services I use personally and/or believe will be a good fit for my readers. The views and opinions expressed on this blog are purely my own. Results may vary. No monetary compensation was received. I know my puppy will need this espeically for the mess. I like the Neater Feeder in Bronze! These bowls are so nice! I would get the size made for cats. My older cat is starting to lie down to drink. Hopefully this would be more comfortable for him. I would choose red. I like the Neater Feeder in Bronze! I would choose the Large Neater Feeder in Bronze. I would choose the size large in the Bronze color. I would choose a large size for my dog in the maroon color. It would make clean up so much easier. I would pick a size medium in bronze! I have 2 golden retrievers so would like the large neater feeder in cranberry. terri.moore30@yahoo.com thank you! We would need the Large Neater Feeder for our big dog Jack! I like the Large in Red. Cat Neater Feeder in bronze. medium for our new english bulldog puppy! thanks! I would pick the large dog in Bronze! I'd love the cat size! I like the cranberry color, that would look best with our kitchen! I would choose Cat size:) Thanks! I'd choose the small size in cranberry!